I took this photo in August 2010. This little guy was out in the morning looking for bitterbrush and other shrubs to clip and store for the coming winter. When afternoon surface temperatures reach 120+ degrees F on this black lava, this little rabbit will be underground where it is cool. 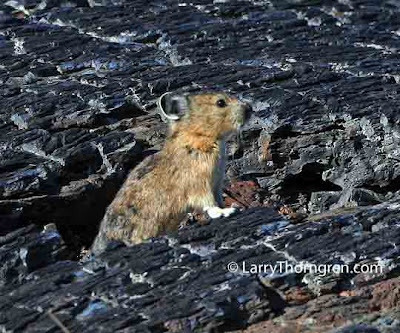 My ten year old grandson served as my Pika spotter when we visited The Craters of The Moon. Pikas are his favorite wild animals. Researchers are claiming that global warming will destroy Pikas all over the world. They need to make a trip to the Craters of The Moon and see that Pikas are very adaptable. that intrude constantly on our nation's wildlife. I am sure that some money-hungry research team has already made a proposal for a research grant to radio-collar Pikas somewhere in North America. These cute litte guys deserve better.